This is a recipe for the famous Filipino dish Ginataang tilapia, or whole fish in coconut milk. 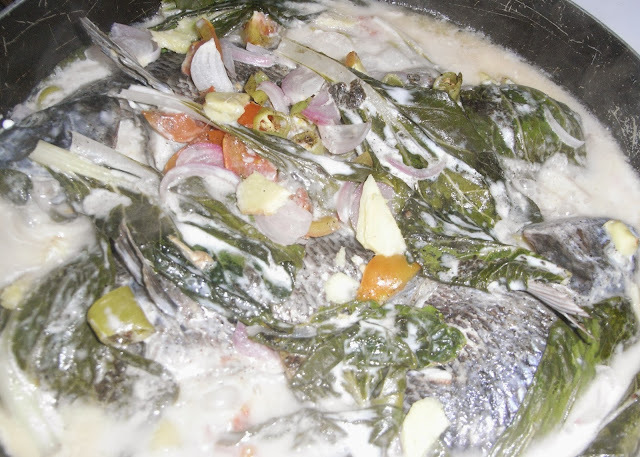 Ginataang tilapia was made more delicious by its sparse ingredients and fresh coconut milk. Quezon Province is coconut province after all. 1. Heat oil and saute garlic, onions. Add the ginger. 2. Add coconut cream and fish stirring occasionally to prevent curdling and burning. 3. In another pan, boil bamboo shoots with water and then drain. 4. Add coconut cream and season with ajinomoto umami super seasoning. 5. Continue to cook till it thickens. Season with some patis. 6. Season the tilapia with salt and pepper then deep fry until golden brown and crispy. 7. Place the fish on a plate then pour the sauce and vegetables on top.